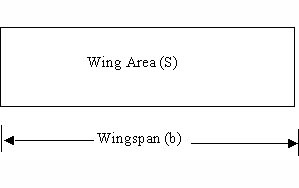 The aspect ratio is the square of the wingspan divided by the platform area of the wing: AR = b2/S. The aspect ratio of a wing is defined as the square of the span divided by the wing area. It is a measure of how long and slender a wing is from tip to tip. For a rectangular wing, this reduces to the ratio of the wingspan to the chord length. High aspect ratio wings have long spans (like high performance gliders), while low aspect ratio wings have either short spans or thick chords (like the Space Shuttle). Gliders have a high aspect ratio because the drag of the aircraft depends on this parameter. A higher aspect ratio gives a lower drag and a better glide angle. The Space Shuttle has a low aspect ratio because of high-speed effects.